Those who work in the construction industry depend on their employers to comply with safety regulations. Unfortunately, despite the amount of trust you place in your employer, you have to realize that accidents and mistakes do happen. In many situations, these mistakes may not have a deep impact on your life. However, when you work in an industry where a single error could kill you, you can’t just ignore the small stuff—you need to look out for yourself, even if that means reporting overlooked workplace safety violations to the Occupational Safety and Health Administration (OSHA). Conduct regular inspections. Routine inspections of job sites, equipment, and construction materials are required to assure proper maintenance and replacement of dangerous tools. Train employees. Employers are expected to properly train their employees on safety protocols, such as how to identify and avoid hazards, how to properly administer first aid, how to prevent and respond to fire emergencies, and what to do in the event of an emergency. Tag, lock, or remove all unsafe equipment or tools. Employers are expected to regulate dangerous equipment and only permit those properly trained and experienced to use it. Maintain clean work areas. Employers are obligated to ensure that all work areas are kept clear of debris and scrap. Provide lighting and illumination for all work areas. Employers must guarantee proper lighting and illumination for construction sites for the benefit of their employees as well as the general public. Prioritizing maintenance and workspace design to eliminate unnecessary falling or overexertion risks. Encouraging an established safety culture—rather than discouraging employees from reporting dangers, encourage a culture of safety. Establishing an open line of communication regarding hazards and safety concerns. 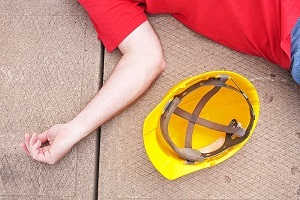 While many workplace injuries may just be bad luck, some occur as the result of an ignored or unnoticed hazard. Although it is your employer’s responsibility to keep you safe, you can protect yourself (and fellow workers) by simply paying attention and looking out for these potential hazards. Lighting. Proper lighting is essential for safety—both for construction workers and for the general public. Extensive lighting is especially important for work areas around highways and busy streets, as an alarming number of construction workers are struck by passing motorists who failed to see them until it was to late. Proper safety gear. Safety gear should be considered as important as the equipment or machinery needed for the job. Hard hats, reflective clothing, goggles, and other safety gear were created to keep you safe, so make sure you and your coworkers are properly outfitted at all times. If your employer fails to provide you with adequate gear, he is in violation of his responsibilities. Electrical receptacles. Electrocution is a huge risk on a construction site. All electrical receptacles need to be fully enclosed to protect you, your fellow workers, and anyone else who may come within electrocution range. If you feel that your employer often violates safety regulations, you can file a complaint with OSHA and even ask for an inspection of your workplace. If you do not want your employer to know you filed the complaint, just tell OSHA, and they will not share your identity with anyone. Furthermore, OSHA offers protection for employees who report safety issues under the whistleblower rules of the OSH Act. For more information on workplace safety, or to speak with an experienced workers’ compensation lawyer about your construction accident, schedule your FREE consultation with Attorney Steve Lee today. Do I need a lawyer for my work injury claim?